I greet the visitors as they step into the House, and give them a brief summary of what they are seeing. The House is also known as the Mansion, but Pierre du Pont’s tastes were modest, and “Mansion” seems pretentious for a home with such rustic charm. When he and his wife were married, they bought much of their furniture from Philadelphia’s Van Sciver’s and Wanamaker’s department stores where many of us bought our first furniture. The ornate spiral staircase to the second floor (now offices) seems out-of-place, small, reluctantly built in the back of the House conservatory by Pierre when his relatives were constructing much larger and elaborate ones in their traditional mansions. I originally felt greeting visitors was unnecessary. No one greets the visitors as they enter the Main Conservatory, nor do they expect it. But another volunteer pointed out that we are in Pierre du Pont’s home, and visitors should always be greeted as they enter someone’s home. I am, in fact, filling in for Pierre who would certainly be greeting them if he was here. And the visitors are delighted to be greeted, so it is fun for all of us. Two of many Peirce descendants. It is now called the Peirce–du Pont House because they are the two families who ever lived there, although at different times. The Peirce family (note the unusual spelling) were Quakers from England who had settled in a farm a few years before William Penn’s second arrival in 1699. Thornbury township in Pennsylvania is named for their farm, which was named for their home town in England. Many of their descendants still live in the area and occasionally introduce themselves as they visit the House. Talking with them is one of the pleasures of volunteering there. George Peirce was the prosperous patriarch of the family who bought an additional 400 acres from William Penn in 1700 for his children Joshua and Betty, thereby becoming the first property owner west of the Brandywine River. He divided the property between them, and Joshua got the parcel that eventually became the Longwood property. Joshua first built a log cabin that has since disappeared. In 1730, he and his second wife, Rachel Gilpin, (She was a local girl, born in a cave, and “Gilpin” is still a common name in the Wilmington area.) replaced it with a brick structure that may have covered up the original log cabin foundation, or the cabin may have been nearby. (I favor the latter because I expect Joshua would want to have a place to live onsite as he built the brick structure.) The form of the original brick structure can still be seen today within the subsequent enlargements of the House. Joshua died in 1752, leaving the property to his children, but the home went to Caleb, Rachel’s third son, on condition that he care for his mother (“fetch and carry as much firewood as his said mother will burn in moderation.” She was also to have the use of a mare and cow, and one “Sellar” in the west end.) Caleb soon married Hannah Greave, and among their children were twin sons, Joshua II, and Samuel, who, in about 1800, began planting the original trees that can still be seen at Longwood in parallel rows behind the House. They gradually transformed part of the old farmland near the house to a fine arboretum, possibly encouraged by the Quaker botanist, Humphrey Marshall, who lived nearby. Since these were still the days of the horse-and-buggy, the visitors must have been locals. In 1824, the Peirce family enlarged the original brick structure to what is now the right (south) side of the House in the photo above. 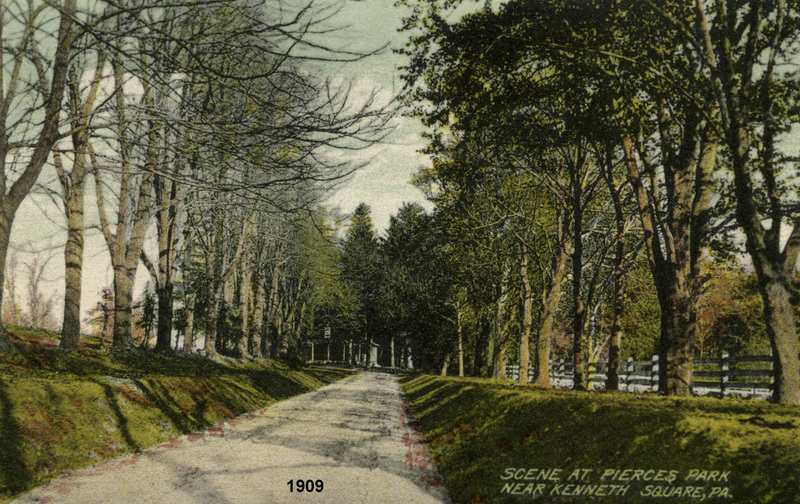 A postcard of Peirce’s Park, 1909. The House is at the end of the long driveway, now a pedestrian walkway. In 1860, the arboretum was one of the best in the country, and the son of Joshua II, George Washington Peirce, opened it to the public as Peirce’s Park. I imagine it was something like Lenape Park near Chadds Ford that we were familiar with. At Lenape Park, entrance was free, but there was a modest charge to use each feature. At Peirce’s Park, the picnicking public could swim or boat in the large lake, still an item at Longwood Gardens. George Washington Peirce died childless in 1880, and the park passed on to his sister, Mary Ann Peirce Stebbins. She was a reluctant absentee owner, and when Mary died in 1897, the property fell further into disrepair and was eventually sold. It had neither indoor plumbing, central heat, nor electricity. The property rapidly changed hands several times in the first year, and the last owner did not live there but only planned to cut down the old trees for timber. He even built a small sawmill behind the house to begin the process, but Pierre du Pont stepped in and bought the property and the timber contracts in 1906, literally “to save the trees.” He had been living in his mother’s mansion just outside of Wilmington on Kennett Pike (Rt. 52), a road that went straight north to Peirce’s Park, so it’s sale would be expected to attract his attention. Pierre paid $15,500 for the 200-acre property, which would be over $350,000 in today’s dollars. By 1914, he completed the House much as it appears today, adding a matching north side (the left side in the photo without the porch) bracketing a central conservatory that was based on one in the Baldwin mansion on Philadelphia’s Chestnut Street that he admired as a child. The two sides of the House match, but differ by almost 200 years. The back of the House is painted stucco, but I suspect that was done in the renovation of 1995 to cover up the deteriorated brickwork. Pierre would have no reason to skimp. The outside date stone near the peak of the roof is “1730” on the south side (the original Peirce house) and “1914” on the north side (Pierre’s addition). By the end of the 1920s, Pierre had rescued the DuPont company and General Motors, appointed qualified people to run them, and could devote his efforts to further developing the Longwood property. While modernizing and expanding the house, he preserved its rustic charm that visitors immediately notice. He placed the heating plant in the garage behind the house for safety and piped over steam heat. The two structures are connected by an underground tunnel, not open to the public (and not much to see). Although it is far less opulent than some other du Pont family mansions, it is the most livable. Credit must also go to his wife, Alice Belin, who agreed with his tastes. (See posting Alice’s Bridge, 7/3/2013.) They married late and had no children which no doubt factored in the preservation of Longwood Gardens in its entirety. In the 1920s, he built the Main Conservatory to provide fruits and vegetables throughout the winter. A 300,000 gallon oil storage tank, two years supply before the subsequent additions, was built to heat it. The main area of the Conservatory where he had planted orange trees is still called the Orangery. The plants survived, but did not thrive in the low light of our winters, so he soon changed it to a display and entertainment center, adding the ballroom, music room, and organ. Longwood Gardens is still considered to be a display garden whose function is to present a variety of plants at their very best. When plants pass their peak, they are dug up for mulch and replaced with new stock. Visitors often ask when Pierre opened the gardens to the public. Easy answer; They were never closed. The grounds had been open to the public as Peirce’s Park, and Pierre continued the tradition. Only the area surrounding the House was closed to the public to preserve his privacy (as I, myself, saw as a child). The Main Conservatory can now be heated by either gas or oil, whichever is cheaper, or in cooperation with a temporary request by the utility company. (Gas has been cheaper for about the past five years.) The two systems also provide important backup, since one freezing night without heat would destroy almost everything. With the subsequent expansions, the original 300,000 gallons of oil would only last one year as the sole source of heat. Pierre had owned greenhouses at several previous places where he lived. He loved plants and trees and fountains, all continuing features of Longwood Gardens. He did not like statues of people, and the only two, life-sized saccharine depictions of a French peasant boy and girl, were gifts that he felt obligated to display, but kept tucked away in niches in the wall of the fountain pump house. 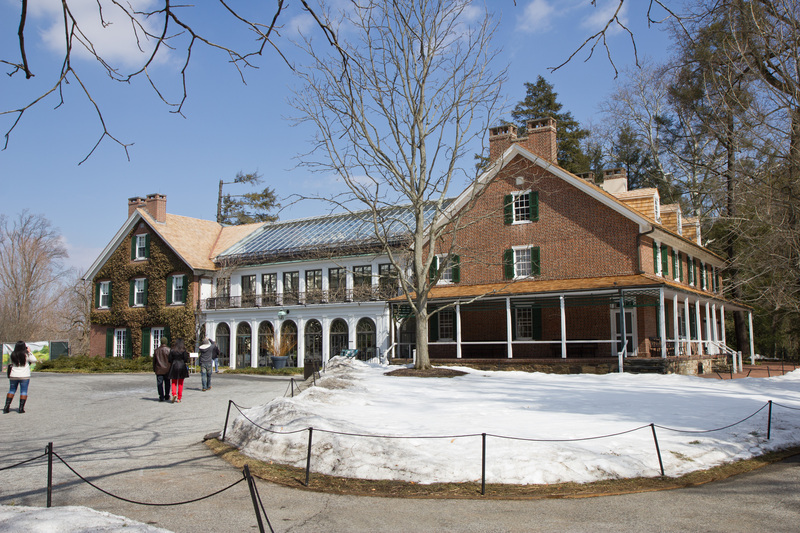 Pierre named his estate “Longwood” after the Longwood Quaker meeting house, still surviving as the Brandywine Valley Visitors Center immediately in front of the Garden entrance. 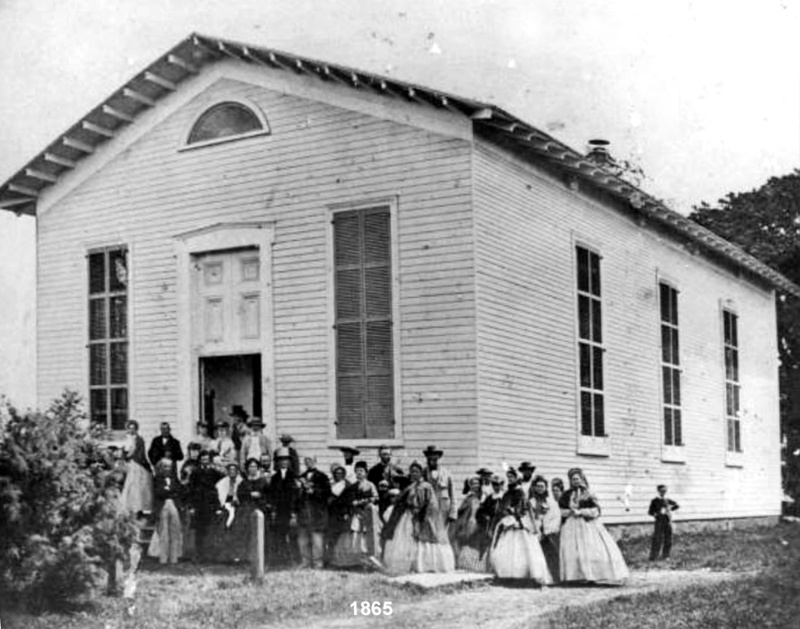 The general area had been known as “Longwood” even before the meeting house was built. One guess is that the name came from a long stretch of uncleared forest nearby. Longwood Gardens was not publicized in those early days. It was my aunt who heard about it. I still remember her announcement to my gathered extended family: “I understand there is a du Pont mansion near Kennett Square where they allow visitors to walk on the grounds. We should all drive up there some Sunday after church.” And that is just what we often did. When my wife and I began volunteering, I was delighted to find we were to park on the far west side in the employee’s parking lot, originally the general visitor’s parking lot where I had so many fond memories. The first visitor’s center was built there and is now the Catawba Room, used for classes and meetings. There are several stories of Pierre walking out to the gardens and talking with the visitors. They assumed he was a gardener and never dreamed he owned it all. He was a very humble person and would not have told them. Pierre set up a foundation to maintain Longwood Gardens after his death in 1954 and also arranged for his housekeeper to remain in the House for as long as she wanted. When she left in 1969, the directors were undecided how to integrate the House with the rest of the Gardens, and it remained closed for many years. In 1995 they restored it as the site for a historical exhibit that has been very successful. The exhibit covers the early history from the local Lenni-Lenape tribe of Native Americans and the first Quaker settlers, through William Penn, the du Pont’s emigration from France, the Peirce family, to Pierre’s development of Longwood Gardens and the modern Du Pont Company. All of this is presented in a self-discovery format of videos and displays while still preserving the charm and features of the House. The empty upstairs rooms were converted into offices. Over the years, Pierre added to the property by buying adjoining farmland, including the Webb farm that had always been separated on the east side of Route 52. Recently, that highway was moved further east, and Longwood is developing the land as an expansion of the increasingly popular Meadow area. The expansion is expected to open early this spring and is said to be on schedule despite the difficult winter weather. The Peirce-du Pont House will become the hub for the new Meadow, now doubled in size to 80 acres. This entry was posted in du Pont History, Longwood Gardens and tagged Longwood Quaker Meeting House, Peirce family, Peirce's Park, Pierre Sameul du Pont, Rachel Gilpin. Bookmark the permalink. 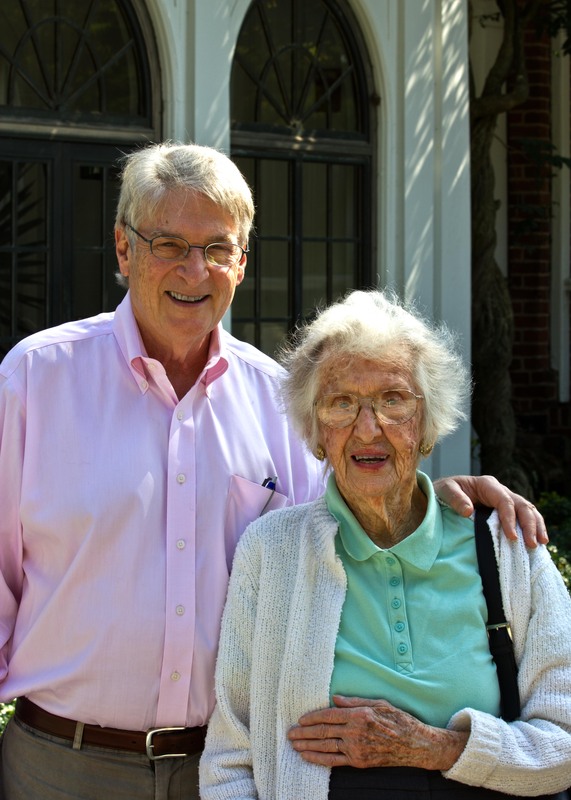 Enjoyed this story on Longwood. Spent a good bit of time there when I was growing up, before the house was restored. Once I finished that story, I went on to the posts that followed. So delightful and written with such a nice, light touch. Great blog! I am a direct descendant of Joshua Peirce. I so want to vist here some day soon! Thanks for the history! My grandfather grew up next door to Longwood Cemetery. He and his brothers used to play on the Peirce farm. We have Peirces/Pierces in our ancestry and many are buried in the cemetery there. I am the 7 Great granddaughter of George Pearce the original land owner of Longwood Gardens which was once called Peirce Park. I would love to visit the Gardens, the pictures are beautiful. Jenny- I am a 8th great granddaughter of George Pierce. Joshua was my great uncle and it was his sister Mary who was my 7th great Grandmother, so I guess that makes us cousins! This is on my list to visit some day. Loved the article and pictures. Thank you for sharing Roger! Look forward to learning more when I visit. I also am the 7th great granddaughter of George Pearce!! We must be cousins!! Please contact me on my e-mail if you would care to trade info with me.